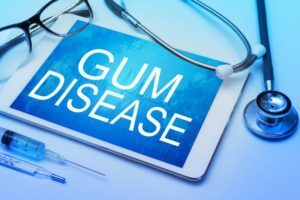 What Exactly Is Gum Disease Therapy in Brookfield? Discussions about oral health often center around the teeth, but gum health also plays a huge role in the wellness of your mouth — in fact, this soft pink tissue can affect your entire body. Therefore, it’s important that you understand what gum disease therapy in Brookfield is. What exactly does this treatment involve, and how can you know if you need to visit your dentist to get your gums taken care of? Gum disease, often called periodontal disease, has two main phases; it begins as gingivitis, but if the problem progresses, it becomes periodontitis. Gum issues develop when bacteria sneaks beneath the gum line, where it can affect your bones, your tooth roots, and your entire body. You should never underestimate the seriousness of periodontal disease. If it is left to run rampant, the bacteria that caused it can lead to cardiovascular disease, stroke, and even dementia. It can also make diabetes more difficult to control and cause women to give preterm birth. Perhaps the scariest thing about gum disease is how common it is. According to one estimate, about half of adults age 30 and over suffer from this condition to some degree. How, then, can you know if you are in the unfortunate half? Your gums are swollen, tender, or bleeding. Your teeth are becoming looser. There is pus around your gums. You notice a change in the way your teeth fit together when you bite down. The earlier you can spot gum disease, the better, which is why you should visit your dentist at least twice a year for a checkup. Catching the problem in its beginning stages will make treatment much simpler and easier. Fortunately, your dentist is equipped to help you recover from gum disease, whether the problem is just starting or it has become severe. Conservative gum disease therapy involves a deep cleaning, wherein your dentist removes plaque and tarter from your mouth. They may also smooth out the tooth roots so it is more difficult for bacteria to cling to them. This deep cleaning, combined with a few adjustments to your oral hygiene routine, may be able to stop gum disease and perhaps even reverse it. If you have advanced periodontitis, your dentist may have to refer you to a specialist who can perform surgery to get your oral health back on track. Happy gums make for a happy mouth and a healthy you! If you think the pink tissue that supports your teeth isn’t doing as well as it should, it’s time to pay a visit to your dentist. The team of doctors at Elmbrook Family Dental is passionate about providing top-quality care to folks in Brookfield. If it’s time for a checkup, or you have concerns about your gums, please get in touch with us. You can reach us via our website or by phone at 262-784-7201. Comments Off on What Exactly Is Gum Disease Therapy in Brookfield?